The N.C. Cooperative Extension Service will be holding a seminar on how to establish and maintain your strawberry, blackberry, and raspberry patch. Topics include the basic cultural needs of these three berry types. Learn more about site selection and preparation, proper soil conditions, fertility needs, spacing, trellising, weed control, choosing the right cultivar, pruning, training, and harvesting. Finally, we will discuss the most common disease and insect problems and their possible control options. For more information or to register for these free classes contact your local N.C. Cooperative Extension Center at 586-4009 in Sylva or 488-3848 in Bryson City or email clbreden@ncsu.edu. 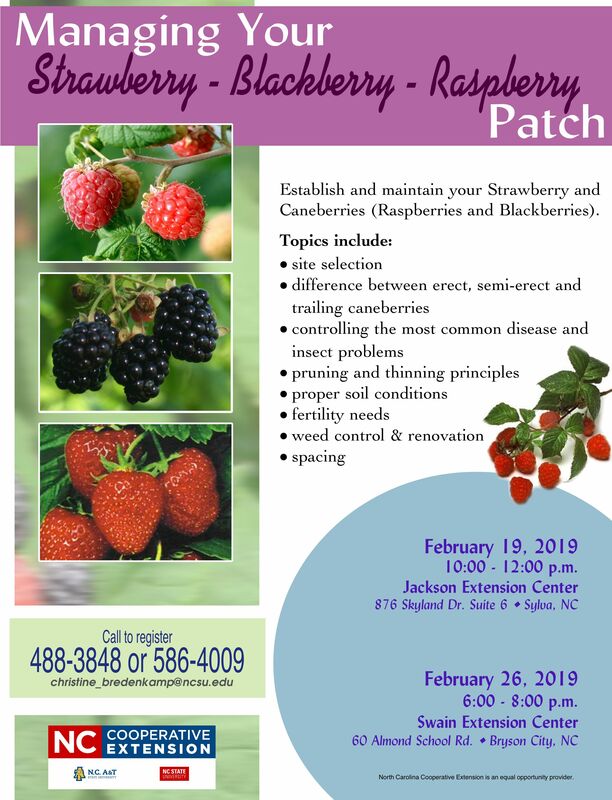 The following strawberry, blackberry, & raspberry seminars will be held in Jackson County and repeated in Swain County. Tuesday, February 26, 2019, at theN.C. Cooperative Extension, Swain County Center on 60 Almond School Rd. Bryson City, N.C. in room 114, from 6–8 p.m.